Print: 9 x 6 x.5 inches, With Display Base: 9.5 x 6.75 x 2 inches. Our clear acrylic display of Johannes Vermeer -- Girl with a Pearl Earring. 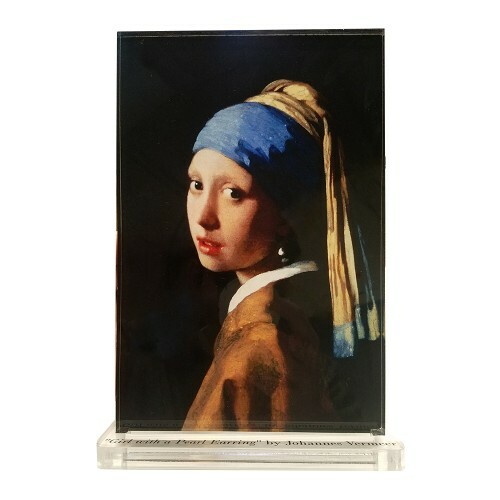 All acrylic displays come in two pieces: a printed base with the artists name and title of their famous painting, and printed artwork on half inch clear acrylic. Items are printed and produced to order. Printing and processing takes up to 5 business days plus shipping time to your location. Masters Behind the Glass are NOT printed on glass but gives the illusion of glass.Girl with a Pearl Earring (Dutch: Meisje met de parel) is an oil painting by Dutch Golden Age painter Johannes Vermeer. It is a tronie of a girl wearing a headscarf and a pearl earring. The painting has been in the collection of the Mauritshuis in The Hague since 1902.